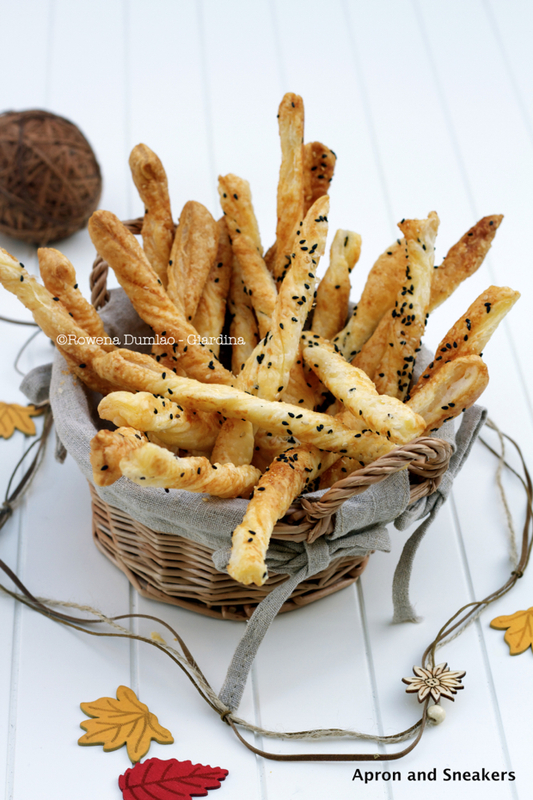 For New Year's Eve dinner, I decided to prepare a basket of cheese straws for the two grissini munchers. While I was preparing them the night before, they guessed that I was making some grissini that both decided to stick around and hovered around me and the cheese straws like hawks. I explained that they are not like the grissini that they are used to because these are flaky but they can be more flavorful because of the parmigiano reggiano. Since the cheese straws cook fast, they also managed to stick around when I pulled out the tray from the oven. Freshly baked grissini, very late at night and two kids fighting over who gets the longer one later, they finally settled on their own chairs and munched away while flakes were flying everywhere. These cheese straws don't win points with me on that aspect. Not even the neighbors who had to hear the vacuum cleaner running at such an hour. I don't know how I bargained with them, but I was able to shoo them away and stack the cheese straws somewhere safe from their reach until the following night. I was happy because they loved them. What a sweet reward for cooking. 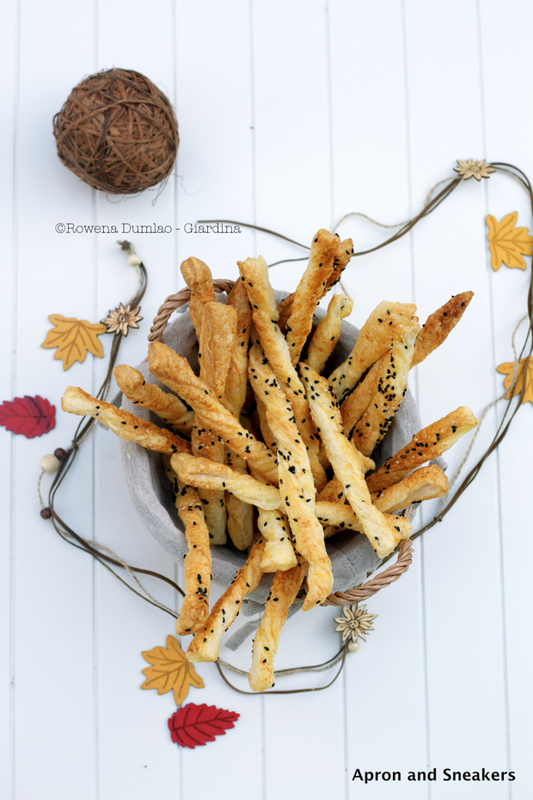 I have been wanting to make these cheese straws for such a long time after seeing a number of them at the internet. I wanted my kids to try them and I was curious about them. After studying some procedures, I came up with this one. Some brush eggs or butter on the pastry but I decided to go for extra virgin olive oil. Parmigiano reggiano is pretty basic to use and since my kids are both dependents of this cheese, I used it too. For the seeds, I was undecided between flax, poppy & sesame. I decided to play it safe and sprinkled sesame. Now that I know how easy they are to make, I will experiment on other flavors next time. For the meantime, here is my first trial to cheese straws. A fun and rewarding recipe I have to say. Roll out the puff pastry on lightly floured working table. Brush the puff pastry with extra virgin olive oil. Distribute the Parmigiano Reggiano and sesame seeds on the puff pastry. Pass the rolling pin or press with both hands lightly the puff pastry with parmigiano and sesame seeds to press the toppings on the pastry. Holding both ends of the sliced puff pastry, twist several times. Do the same to the others. 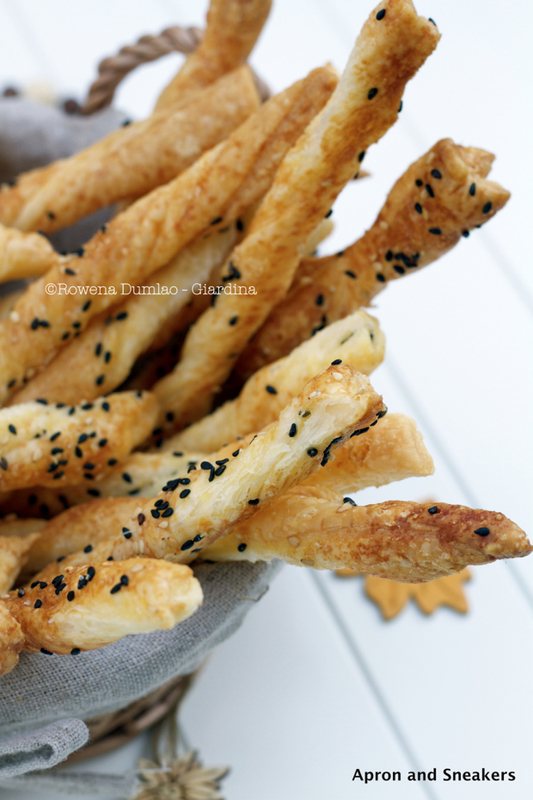 Sprinkle more sesame seeds and the fleur de sel on the cheese straws. Spray or drizzle lightly with extra virgin olive oil. Transfer the cheese straws to a baking pan lined with baking paper. Don't overcrowd the cheese straws, give about 1 to 1/2 inch spacing. Bake in a pre-heated oven at 180 degrees Celsius for about 10 - 12 minutes or until they turn golden brown.